These Coats of Arms may or may not be authentic. 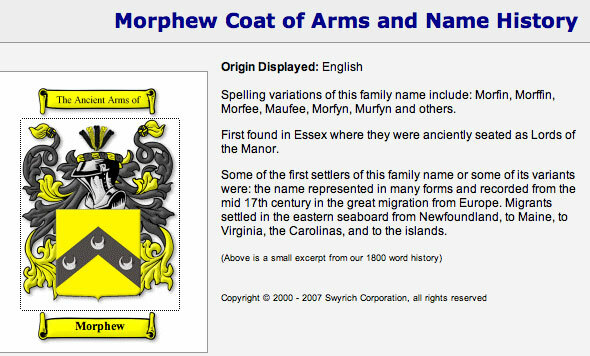 Some would question whether or not our family was ever granted Arms. They are presented here because they are colorful, attractive, easily accessible on the internet and may be a part of our family history. Obs. Forms: 4-6 morphe, 5 morphu, -fu, -fw, morffue, 5-6 morfew, 5-7 morphue, 6 morfewe, 6-7 morphewe, 5-9 morphew. [ad. med.L. morphea (written in mod.L. Morphoea), a. Ital. morfea, of obscure origin. Cf. Fr. morph&eacu.e (16th c.).] A leprous or scurfy eruption. black, white morphew. A. 1400 Stockh. Med. MS. ii. 962 in Anglia XVIII, It distroith &th.e morphe And disposing to &th.e lepre. ? C. 1400 Lanfranc's Cirurg. (Brit. Mus. Add. MS.) 4 Cap. iiij of Morfu, ffrakles,..& Cicatrices of woundes. ? C. 1400 Lanfranc's Cirurg. 193 Morphue. ? C. 1400 Lanfranc's Cirurg. 195 &Th.e white morphu is curid wi&th. purgacioun &th.at purgi&th. roten fleume. ? C. 1400 Lanfranc's Cirurg., 195 &Th.e blac morphe is curid wi&th. ofte purging of malancoli. C. 1440 Promp. Parv. 343/1 Morfu, sekenesse, morphea. 1545 Raynold Byrth Mankynde iv. vi. (1634) 201 This is also very good for the Morphew, and other discoloration or staining of the skin. 1562 Turner Baths 1 The bathes of brimstone..are good for the whyte morphewe and black. 1586 Bright Melanch. xxi. 124 Then altereth the colour, and fairenesse is turned into morphe. 1688 Holme Armoury ii. 428/1 Morphew is a disease that dyeth the skin yellow. 1748-9 Gen. Advertiser No. 4440 Tetters, Ring-worms, Morphew, Sun-burn. 1794-6 E. Darwin Zoon. (1801) III. 124 Morphew or freckles-Tawny blotches on the skin of the face and arms of elderly people. 1810 Splendid Follies II. 106 A few morphews and wrinkles incident to her age. 1835 Browning Paracelsus iv. 117 My outward crust Of lies, which wrap as tetter, morphew, furfair, Wrap the sound flesh. fig. 1610 Bp. Hall Apol. Brownists 29 He cannot but acknowledge..a true face of a Church (though ouer-spreade with some morphue of corruptions). 1647 Ward Simp. Cobler 21 No man ever saw a gray haire on the head..of any Truth, wrinckle, or morphew on its face. attrib. 1541 R. Copland Guydon's Quest. Chirurg. Q iv b, The seconde is a morfewe colour & derke. 1640 H. Mill Nts. Search 147 The morphew wals are growne so bleake and thin, They have..lost the outward skin. Hence mo'rphewed ppl. a., afflicted with morphew; also fig. 1598 Bp. Hall Sat. iv. v. 26 Whose..sullen rags bewray his Morphew'd skin. 1610 R. Tofte Honours Acad. iv. 150 Thogh the Sunne sheweth himselfe pale, morphewed and ghastly, yet was he by all creatures..desired. 1646 G. Daniel Poems Wks. 1878 I. 7 Sometime put A gracefull mole, for a dull morphew'd Spot. 1694 Westmacott Script. Herb. 65 Mark that, you women, and morphew'd ladies. 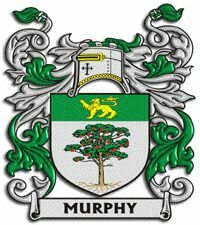 Recorded as Murphy, Murphie and the Manx form of Curphy, this surname is perhaps both the most famous and certainly most popular of all Irish surnames. It is said to derive from the pre 9th century Gaelic name O' Murchadha, meaning the male descendant of the Sea Warrior. As Ireland, the Isle of Man and parts of northern England were for several centuries under Viking control, the association between a name meaning 'sea warrior', and the Vikings is surely more than coincidence. Traditionally, Irish family names are taken from the heads of tribes or from some illustrious warrior, and this name may have even created the tradition. 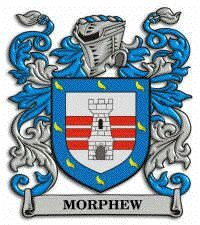 The great O' Murchadha (Murphy) clan of Leinster were originally centred on County Wexford where the clan chief known as "The O' Morchoe", still resides today. A section of the clan moved west to Counties Cork and Kerry in the early 17th century, and is particularly associated with the barony of Muskerry. John Murphy (1700 - 1770), better known as Sean O' Murchadha na Raithineach, was the last chief of the famous bards of Blarney Castle. Another section moved to Ulster, where they were originally known confusingly as both Mac Murchadha and O' Murchadha A chief from this section was Flaherty O' Murphy, recorded in the Annals of Tir Boghainne, County Donegal. Two heroic bearers of the name were the Wexford priests, Rev. John Murphy (1753 - 1798), and Rev. 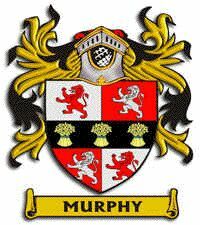 Michael Murphy (1767 - 1798) who lost their lives in the Rising of 1798. The first recorded spelling of the family name is shown to be that of Domhnall Dall Ua Murchadha, chief sage of Leinster. This was dated 1127, during the reign of Turlough Mor O'Conor, High King of Ireland, 1119 - 1156. Over the centuries, surnames in every country have continued to "develop" often leading to astonishing variants of the original spelling.